Hello and welcome to this penultimate presentation of my pastry passion, pies! The World Cup is here and as such the end of the regular football season is nigh and whilst their professional counterparts have been on holiday for a couple of weeks junior footballers are winding up their seasons. Todays review comes from the East of Scotland Super League side Camelon. One of the quirks of going to a game of football pretty much anywhere is sometimes you see the occasional familiar face that you haven’t been expecting. Junior football has been littered with ex=pro’s over the years but the foreign contingent whilst a little harder to find are still relevant. For example former St. Mirren, Hamilton and Hearts winger Jose Quitongo played for as many junior clubs as he did senior and the Angolan is now manager of Ayrshire district side Muirkirk whilst former Swedish international Robert Prytz lit up the junior game in the late 90’s playing for Pollok despite being closer to collecting his bus pass than starting his first day of school. These are just two examples of which I know there are many more which brings us nicely to the subject of today’s pre-pie diatribe, former Trinidad & Tobago international Collin Samuel currently leading the line at Sauchie Juniors. He was in surprisingly good shape although it would not be preposterous to suggest that he enjoys a little bit more of the good life than he would have done so as a pro. I always wonder how players of his ilk end up playing where they do. Is it a case of diminishing powers? A desire to just play for the love of the game or the love of a good party preventing them from reaching their full potential? It’s perhaps a case of picking one of these three but whatever the reason it always brings much joy and chatter to the terraces when a splash of international colour is present at a junior game in Scotland. But for now, and without much further ado, let’s rate some pie! 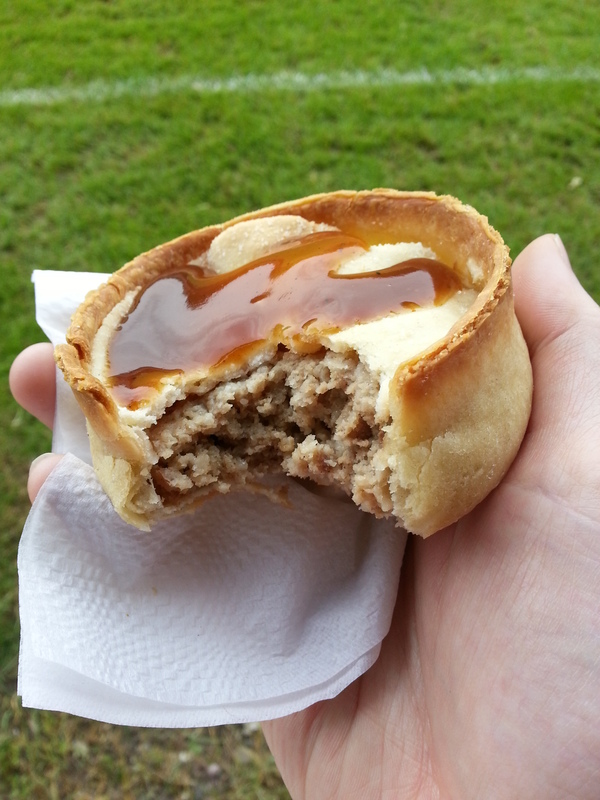 Price: At £1.40 it follows a trend of East of Scotland based pies being slightly more expensive than their western contemporaries, not excessively so and still far cheaper than top end senior Scottish pies but certainly worth a mention. Presentation: A small white napkin that wasn’t quite big enough to have the whole pie sit on top of it. Meatiness: The filling was pretty underwhelming if I’m being honest. 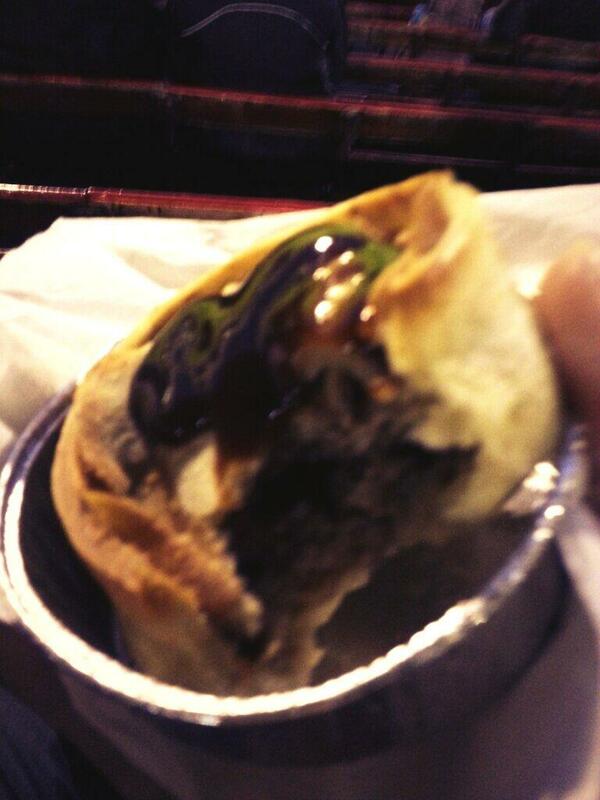 It was well filled and formed but lacked the real punch of flavour a good scotch pie should. After each bite there was no real linger of flavour and, for my palate anyway, there was no peppery heat to help elevate its meaty status. Actually as I got towards the centre of the pie it was a bit cold, perhaps a side effect to the rather large crowd that had gathered at the game a point that was further illustrated to me as I watched the man behind the counter shuttling another two boxes of pies from the back. The lack of heat will have no doubt played a part in the flavour being a little lacking in this particular meat filled pastry. Pastry: The pastry was nothing spectacular and although the top of the casing appeared loose it clung on without flipping over as I took each bite. It held the meat inside sufficiently and provide a change in texture but aside from these primary functions there isn’t much else to be said here. Overall: A pretty average effort, disappointing that it was cold and I was certainly thankful for the bottle of HP on the counter to add some much need depth of flavour. The cold centre makes me wonder if this was microwaved before being finished in the oven but that is pure speculation on my part. Overall though, I’ve had better. So not a stand out offering from Camelon but another pie none the less, the last pie of the season will be coming from Fir Park as I take a break from the Men’s World Cup in Brazil to follow Scotland Women on their journey to Canada 2015 as they take on group favourites Sweden in World Cup Qualifying. This entry was posted in Football Pies, Junior Pies, Sporting Pies, The Life of Pie and tagged angola, brazil 2014, camelon sauchie, Canada 2015, fitbaw, Football, Gravy, junior football, Meat, meatfilledpastries, mince, muirkirk, pastry, pollok, prytz, quitongo, samuel, scotland, sweden, tobago, trinidad.